Do check out my blog section for the latest updates on related to my work. And for a limited time, if you click LIKE on Food ‘n Frame Facebook page, you will receive a FREE e-book on photography called Shooting Like a Pro. I hope you will like my new website. 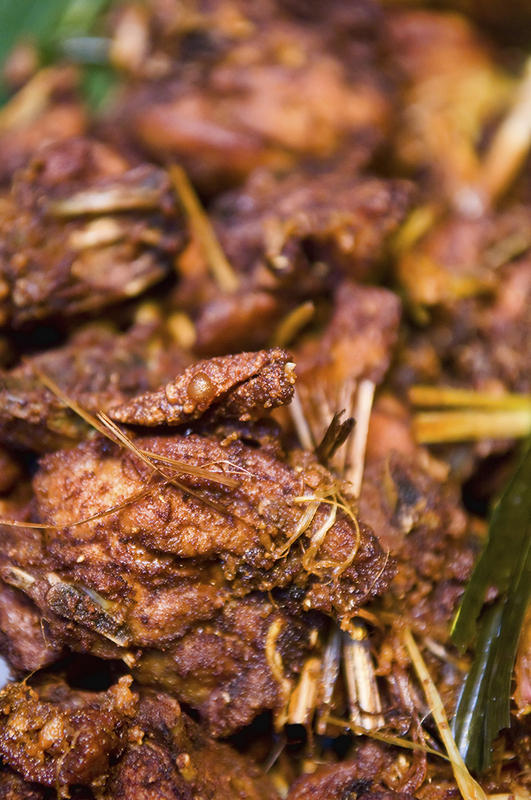 Click here and head on down to Food ‘n Frame. 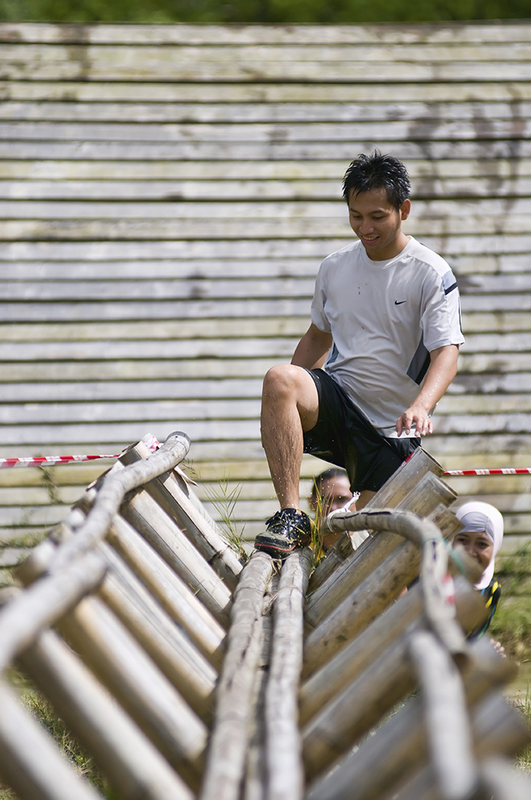 Here is a video compilation of the pictures I took through the entire My Selangor Story 2011 event. It has truly been a wonderful journey and looking back at all the pictures evokes the feeling of happiness to be part of this fantastic campaign. Note: Click on the 360p on the bottom right button on the Youtube player and select 1080p to watch the slideshow in high definition. When I first found out that I was selected for My Selangor Story 2011, I knew I had to bring along my iPhone so that I can Tweet and Facebook while on the go during the five days trip. 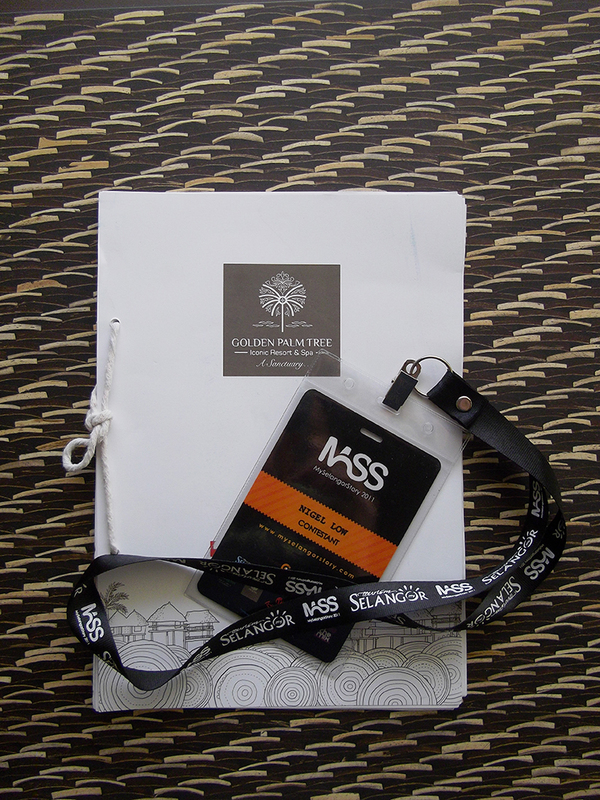 Thankfully, The Cube which is our official telco for MSS 2011 was gracious enough to provide us with a SIM card each and RM 50 credit so that we would stay connected wherever we go. Yay! First of all, what is The Cube? The Cube is basically a mobile content portal where Celcom Xpax user can download music, games, Call Me Tones (where callers get to hear your favourite song while they wait for you to answer), ringtones, Fun talk dedication (Allow you to send a song straight to your friend’s phone along with a personal message) and wallpapers straight to your mobile phone. The fun doesn’t stop here as The Cube also allow subscriber to write on walls, poke existing friends and make new ones all from your mobile phone. With The Cube, you don’t need a smartphone when you have Facebook via SMS at RM1 weekly for unlimited usage. How cool is that? If you are looking for the latest music ringtones, cool animated wallpapers and loads of other EXCLUSIVE content for your mobile, The Cube is everything you need. Just dial *118# to access an array of Xpax services including the latest music, movies and games and data plan activation. 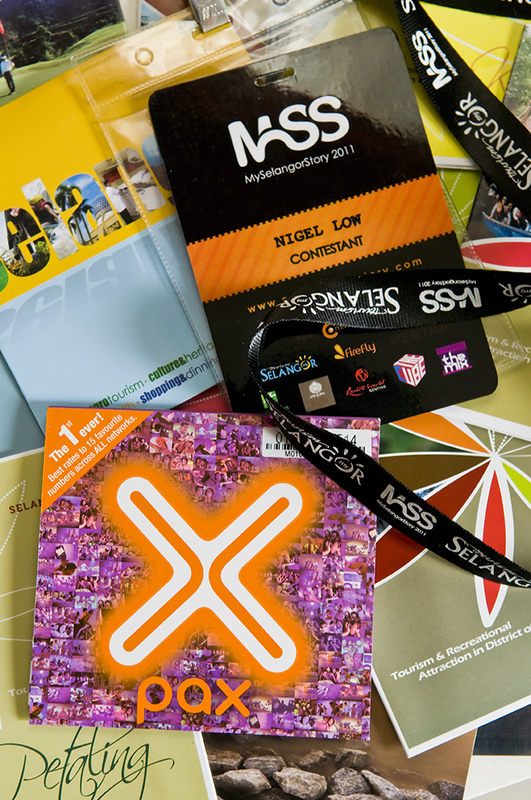 I am lucky to be able to connect to my Facebook and Twitter throughout the entire MSS 2011 event. 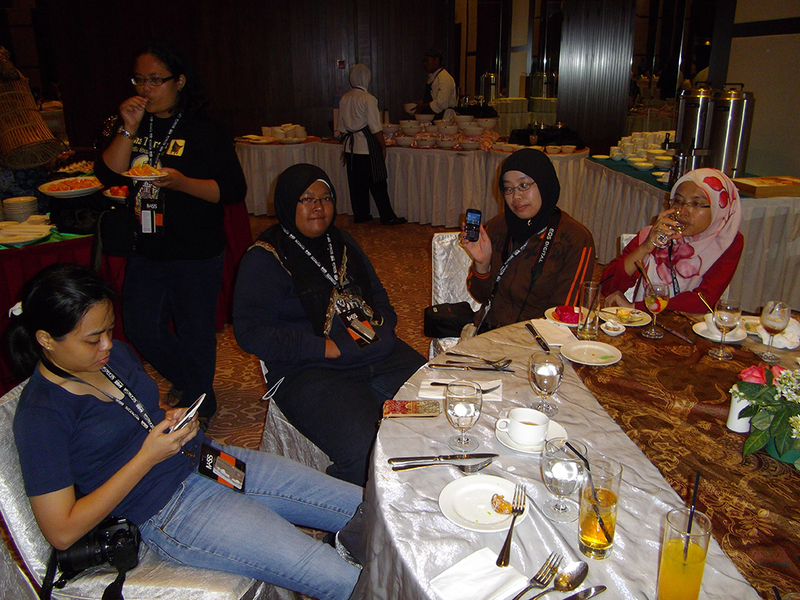 I didn’t know that the rest of the bloggers were so actively twitting until I check my Twitter page! That is not all. 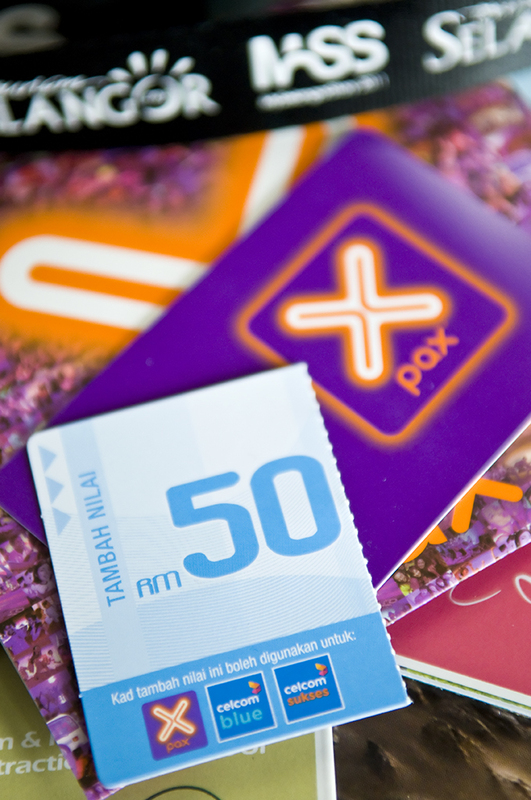 Celcom Xpax is reasonably priced. Each SMS costs only 1 cent to the same network (5 cents to other network) and 28 cents for every 10 minutes of voice call to the same network (28 cents for every 5 minutes to other network). 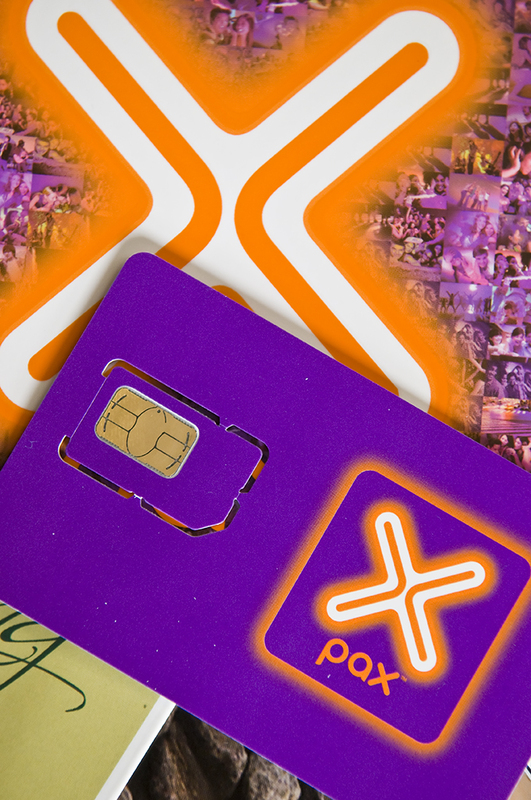 Click here to see the latest SMS and calling rates for Xpax. 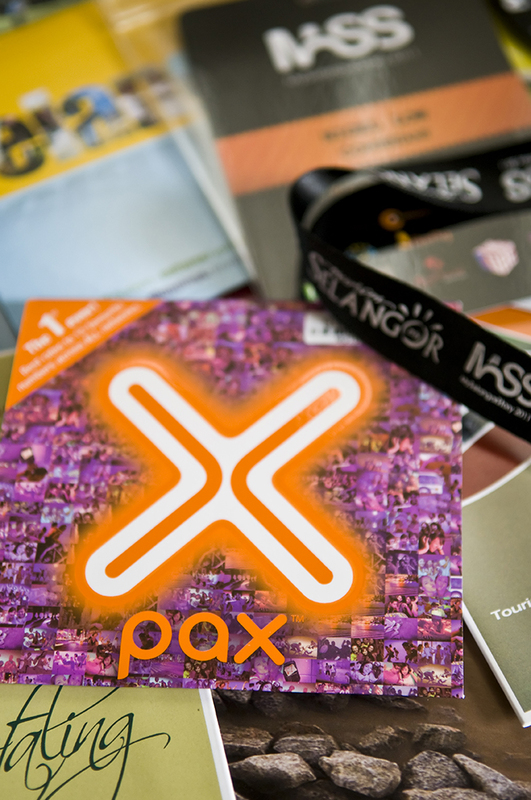 Xpax also offers attractive privileges with awesome offers, discounts at selected dining, hotel, travel, health & beauty and retail outlets. All you need to do is to flash your mobile screen to the merchant to enjoy the privileges! To check out the list of participating merchants, click here. Other features of Xpax include Voicemail, Call Waiting/Hold, Missed Call Notification, SIMcard Rescue and Caller Line Identification. To learn more about Xpax and The Cube click here and here. You can also follow them via Facebook. 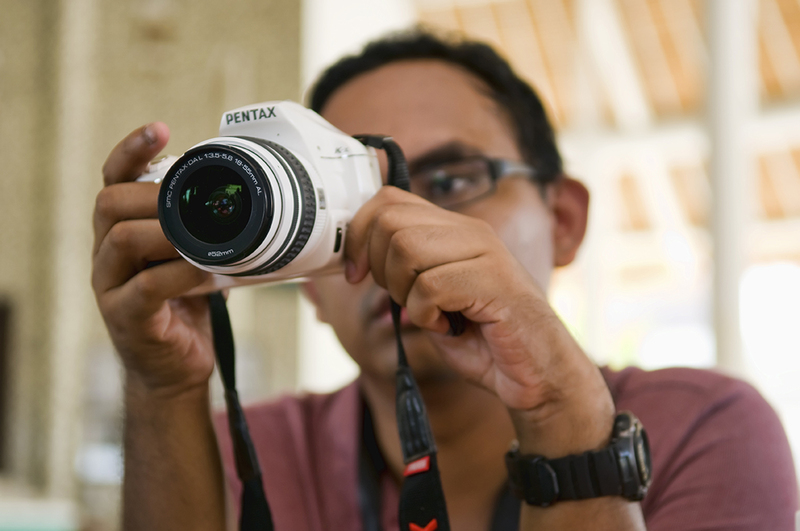 During our participation in My Selangor Story 2011, bloggers were given a Pentax camera each to review throughout the five days tourism blogging event. I had a chance to try out the Pentax Optio RS 1000 which is a pocket size camera. From the outlook, the Optio RS 1000 is certainly an eye catcher. 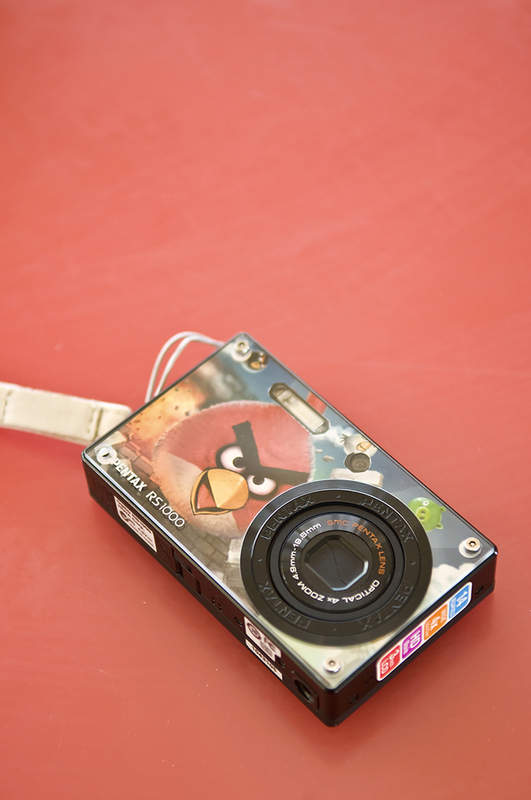 The inclusion of Angry Bird picture on the front of the camera is bound to catch anyone attention. When I first received the camera, there were already a lot of “Oooh-ahhh….” heard from all directions. What’s more, with the rage about Angry Birds nowadays, this camera is definitely a crowd pleaser for those who want to be seen as trendy. Now, let’s list down the technical specification for this camera here. Recorded Pixels: 14 Megapixels, 10 Megapixels, 7 Megapixels, 2 Megapixels 640 x 480 pixels. Surf & Snow – For bright images such as sand or snow. Accurately meters for bright scenes. Text – Captures text in an easy to read manner. Text contrast can be adjusted. When I was writing this review, I realized that I had to be objective in my opinion. For someone (yours truly) who has been accustomed to using a digital SLR camera user, it is pointless to compare the picture quality of the Optio RS 1000 with my current equipment. A fairer approach would therefore require me to give my opinion from a casual shutterbug’s point of view ala point and shoot camera user. Having to say that, let’s look at my experience with using this camera. I love the fact that it is handy to carry around. There were numerous times during My Selangor Story 2011 when I wanted to capture a quick photo of the activity. 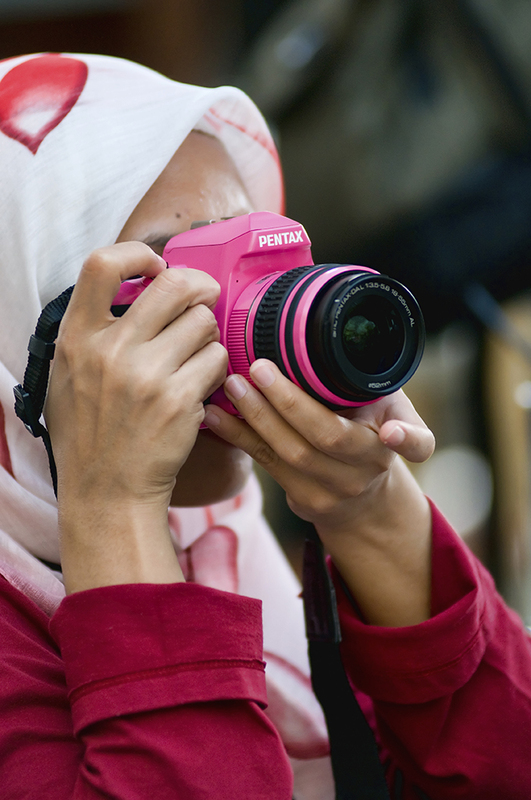 If I would to opt for my SLR camera, it means unzipping my camera bag, mounting my lens, taking off the lens cap, setting my ISO, WB, shutter speed, aperture before I can start taking a shot. Not to mention the need to mount on the additional flash if the scene is dark. With the Optio RS1000, all I need to do is to take it out from my pocket, switch it on and start shooting. In terms of convenience, it is a no brainer that the Optio RS 1000 is a handy camera to carry around. I also love the fact that there is a dedicated button on the rear panel for face detection and smile capture. This is when the camera will identify the individual faces and only take picture when the faces are smiling. Neat huh? Beside the option to select macro with a press of a button, there is also another mode known as super macro. This will allow the user to take super close up shots. Despite not given the manual to refer to, it didn’t take long to figure out how to operate the camera. The on/off button is logically laid out on the top of the camera while the on-screen menu is very intuitive. There are some explanation notes for some of the options in the menu which will help the user understand the more advance features of the camera. As a matter of fact, the menu is straightforward, targeted for users who does not like to fiddle with too many things under the settings menu. Weight wise, the camera was really light. No, make that feather weight! Well, I guess I am used to carry my SLR camera which weighs more than 3kg so anything that is lighter than that is definitely VERY light for me. Now let’s come to the gist of the review which is the picture quality. Under good lighting condition, the Optio RS 1000 is capable of nice taking pictures. The colour of this food shot at Bila Bila in Golden Palm Tree Iconic Resort & Spa is saturated, sharp and has a good exposure. I took a picture of Zaid with strong backlight at the same venue to see if the Optio RS 1000 can meter the scene accurately. Usually, a camera with bad metering system will leave the person’s face looking underexposed to save the details of the highlight (the backlight). 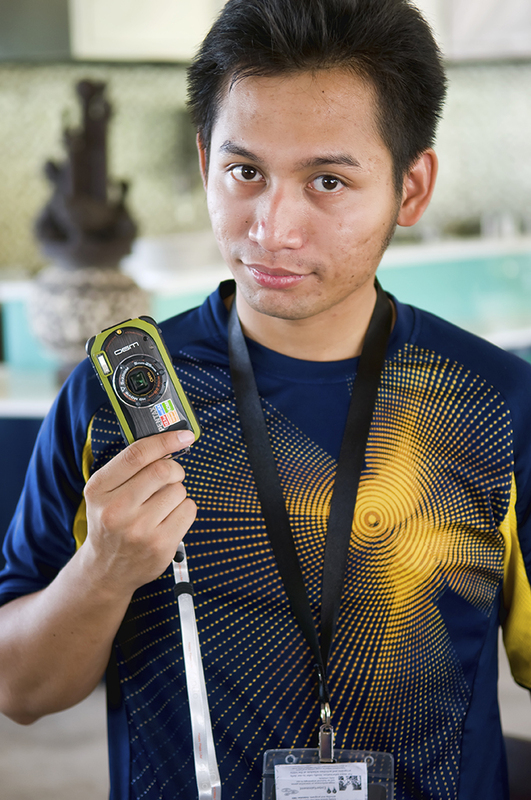 The Optio RS 1000 performed well in this situation as Zaid’s face was decently exposed. Somehow the face detection technology helps the Optio RS 1000 to meter such situation properly. Overall, the camera perform quite well under good ambient lighting condition. 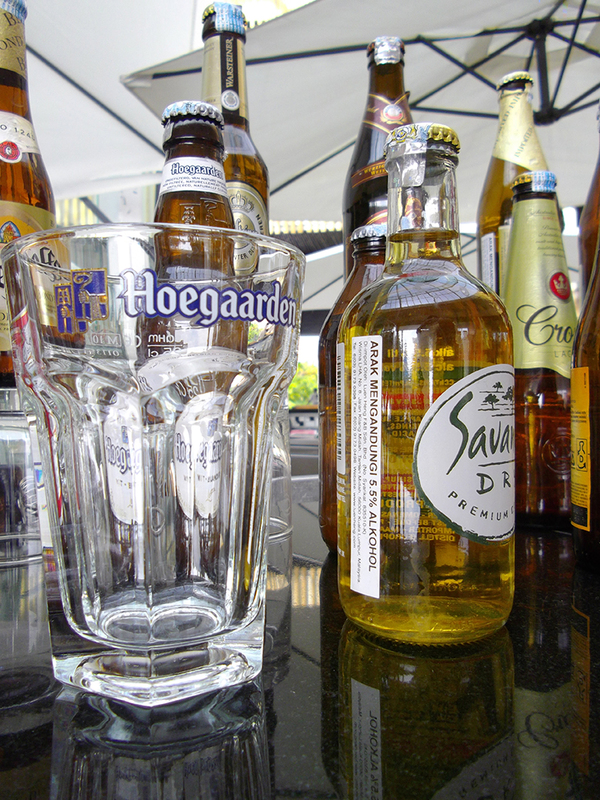 Next up, I tried to use the Macro mode to take some close up shots of the liquor bottles at the bar counter at Bila Bila. Again the image was sharp and the text on the bottle label was readable. In low lighting condition, the Optio RS 1000 stumbles as it try to take this scene at the Grand Ballroom at Golden Palm Tree Iconic Resort & Spa. The noise level was evident and the picture sharpness was dramatically reduced. The picture also looked underexposed. When the flash was switch on however, the detail level was much better. The flash helps to fill in the shadows thus producing a better image. The noise level however is still quite apparent. To test the Optio RS 1000 white balance accuracy, I took another shot of the Grand Ballroom which was lighted with yellow tungsten lighting. Using the flash, I was quite impressed that the camera auto white balance was pretty spot on. At least the picture didn’t turn out with a strong yellowish tint. 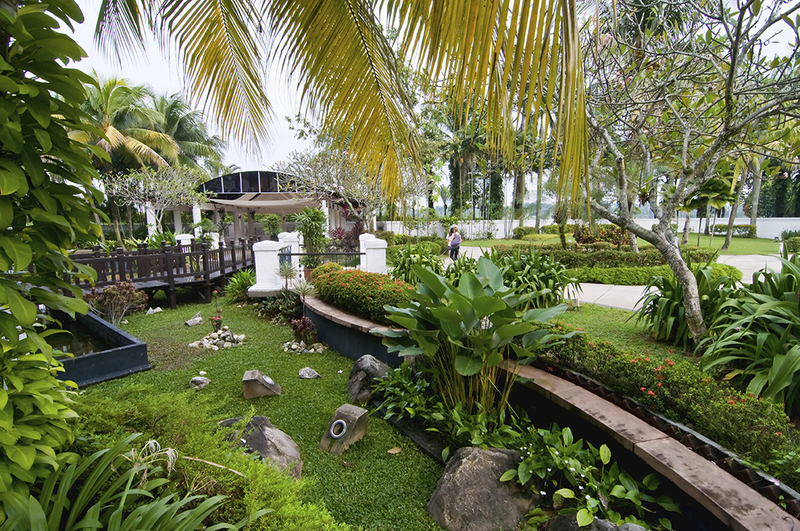 The next morning, I took a picture of landscape at Golden Palm Tree Iconic Resort & Spa. 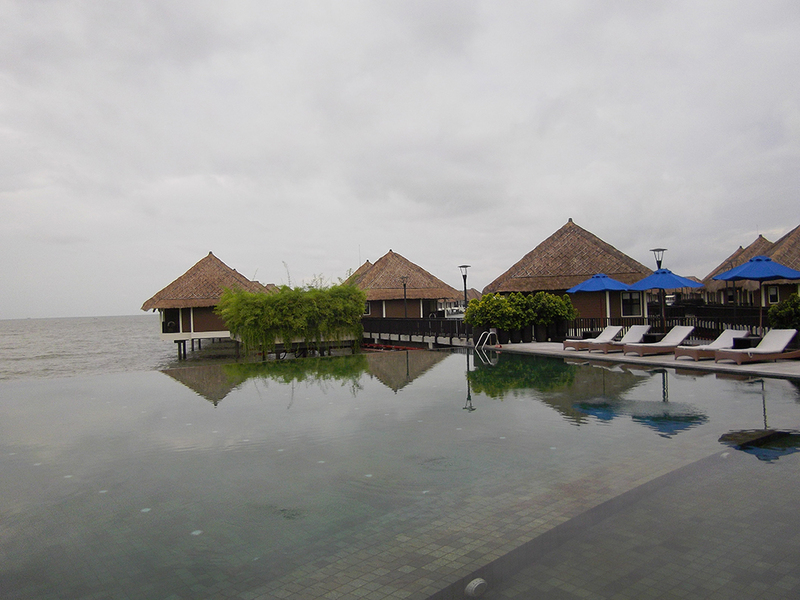 The weather was cloudy and the skies were grayish. I turned on the ‘Blue Sky’ mode to boost the colour of the skies. Too bad it didn’t turned out as what I would expect it to be. Still, the image was usable if not impressive. 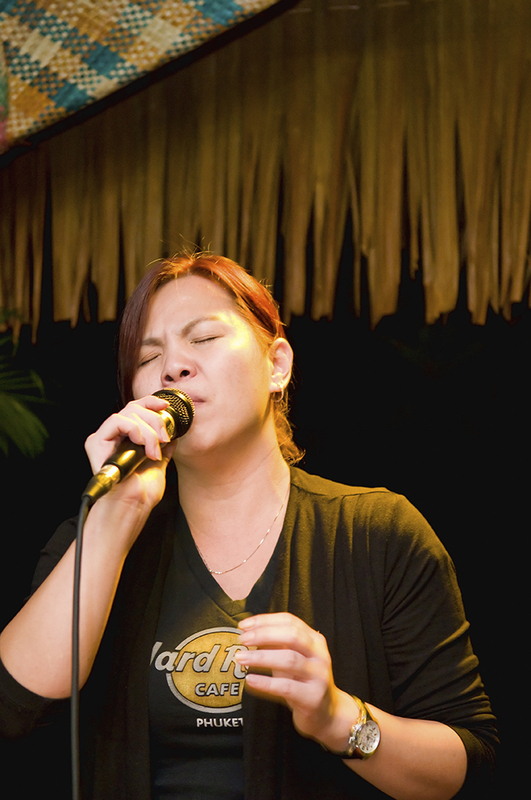 I also tested out the video mode by taking a short clip of a live band performing at Pasar Ikan Bakar in Awana Genting Highlands Golf & Country Resort in low light situation. Although the video looked rather noisy, the exposure was very good given the poor lighting. The sound was crisp and clear too. Overall, for a pocket size camera, the Optio RS 1000 is a decent camera. 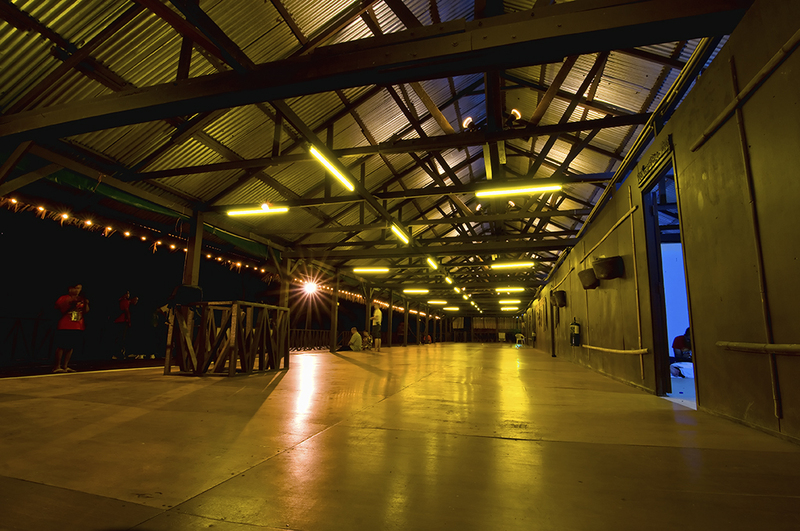 Under good lighting condition, the images captured are sharp with good level of exposure and noise level. However, flash mode is recommended in darker scenes though the noise level will be more noticeable. 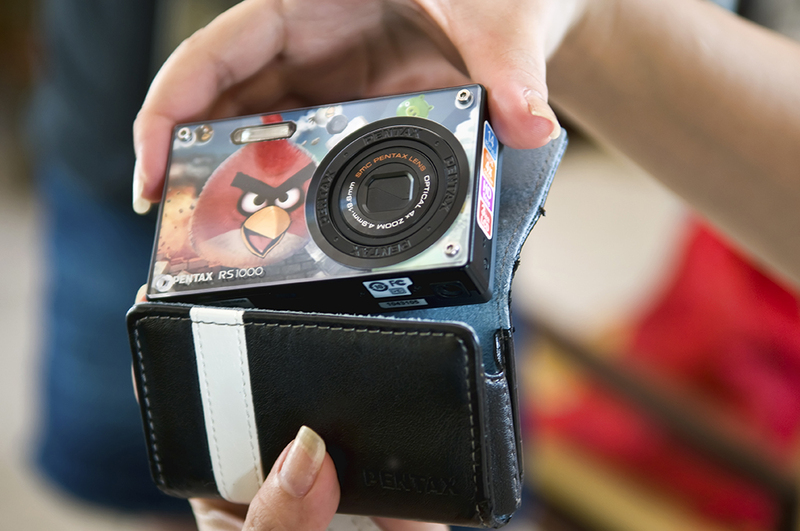 As far as its design is concern, Pentax has cleverly incorporated Angry Bird on the front side of the camera which is a plus point. The menu is easy to navigate and casual user won’t find any complication with its usage. If you are looking for a hassle free camera, look no further. The Pentax Optio RS 1000 could just be the answer you are searching for. 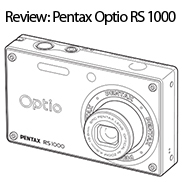 For more information about Pentax Optio RS 1000 click here. 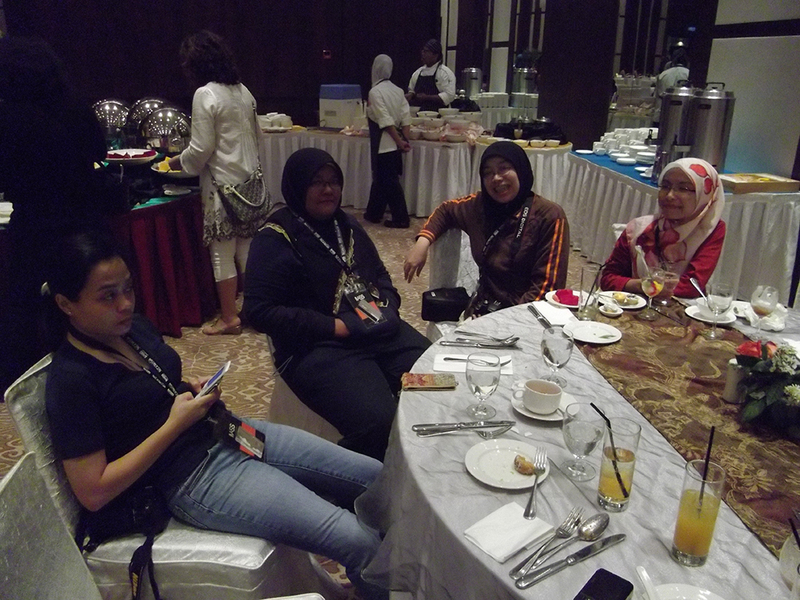 After a tiring day, we arrived at Holiday Inn Kuala Lumpur Glenmarie for some rest & relax time. Unfortunately, I was not feeling well after that and decided to rest, thus skipping the dinner at The Mix. But kudos to Holiday Inn Kuala Lumpur Glenmarie for providing me with a room that is so comfortable to stay in and allowed me to rest and recuperate throughout the night. 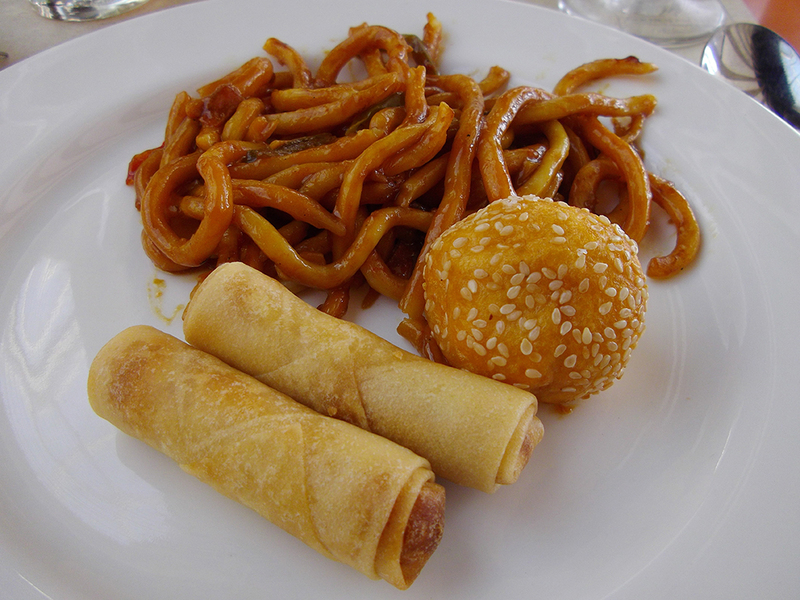 Breakfast was also good with a wide selection of local and international buffet to choose from. Too bad I wasn’t allowed to take any pictures as told by one of the staff working there. 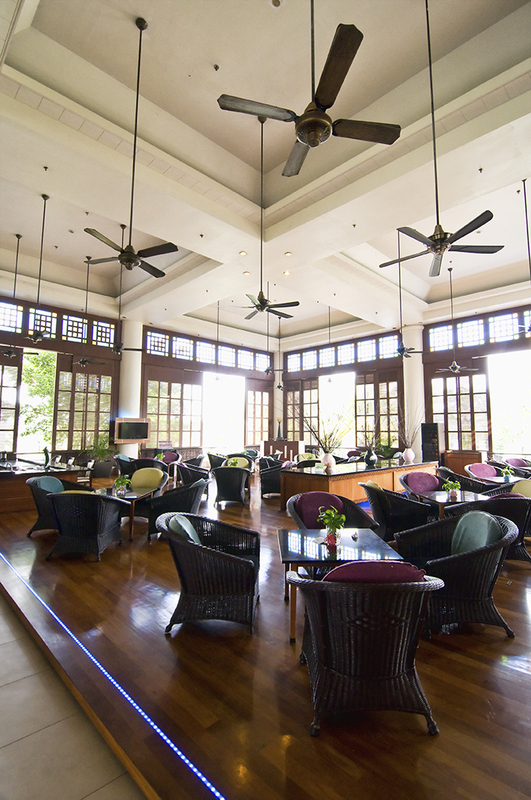 Nevertheless, I managed to took a few shots of this exquisite hotel here. One good thing I love about Holiday Inn Kuala Lumpur Glenmarie is its location which is not too far from either KL or PJ. 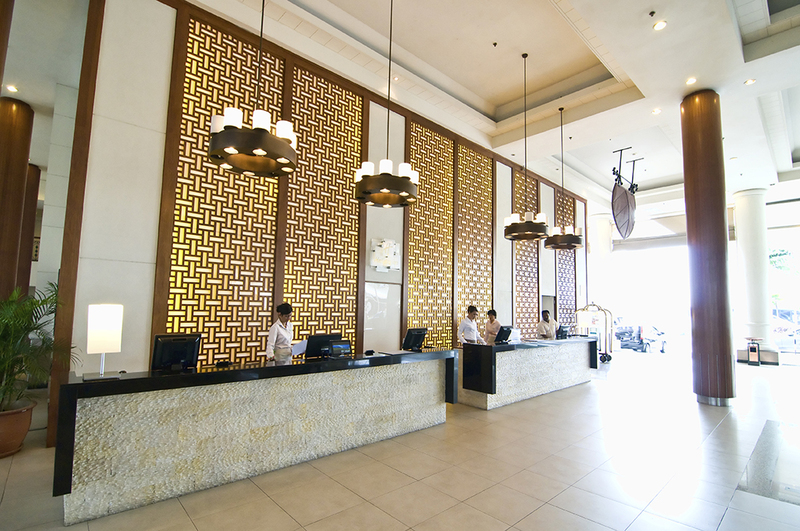 It is also situated in the traffic free area of Glenmarie thus ensuring that I won’t get caught up in the congestion when I left the hotel the next morning. This concludes my story about My Selangor Story 2011. It was definitely a fun experience. 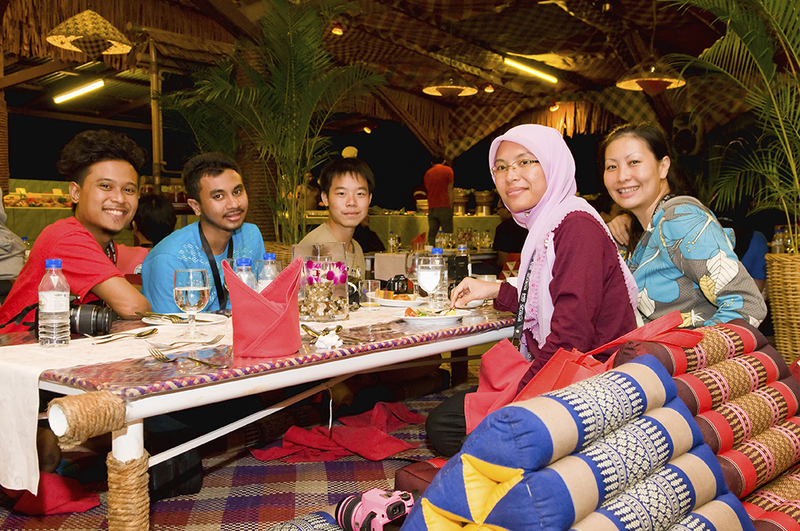 More importantly, it had really opened up eyes to a new horizon through meeting fellow bloggers both from local and international countries. Despite our different backgrounds, cultures and origins, we actually shared more things in common than we realized. I have met new friends whom are now close to my heart. Although this is a competition, it has never felt like one from the first day. The spirit of cooperation, support and teamwork was evident right from the start and even till now, through our close discussion group in Facebook. I have also learned that Selangor has so much to offer in terms of its rich tourism resources and we have barely scratch its surface. I am sure the next MSS will offer even greater depth in terms of the places and activities that new bloggers will be doing. My heartfelt thanks to Horizon Communications for taking up such a tremendous tasks in organizing such an event. And to the sponsors, again your warm hospitality never failed to amaze me. Throughout my five days trip, I have never been happier and comfortable. Despite being really sick on the last few days, I have never felt like going home. 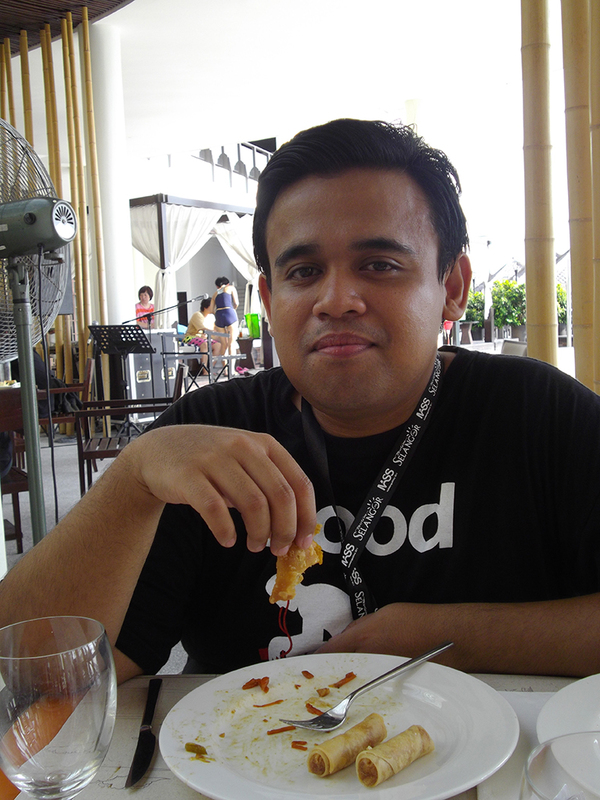 This is my story, my experience and my chronicle of My Selangor Story 2011. Although the journey has ended, I will always remember all the wonderful moments that we shared in this trip. The next morning, we woke up at around 6 a.m. to get ourselves prepared for the MAJOR outdoor activity. Amelia Tan, who is the organizer of MSS 2011 has been hinting to all bloggers about it for the past few days and today is the day! We walked towards a large field where Mr. Zul gave us a short briefing and a morning workout before proceeding for the run. The bloggers were all feeling enthusiastic on that day despite soaking under the hot sun. First up, some exercise to loosen up the hips and getting the engine warm up! 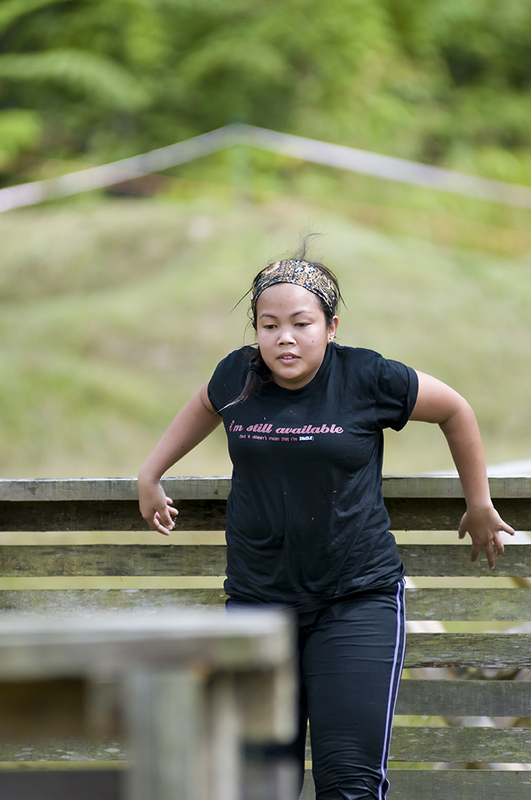 Apparently, bloggers have to run for about 1km before going through a series of obstacle courses. 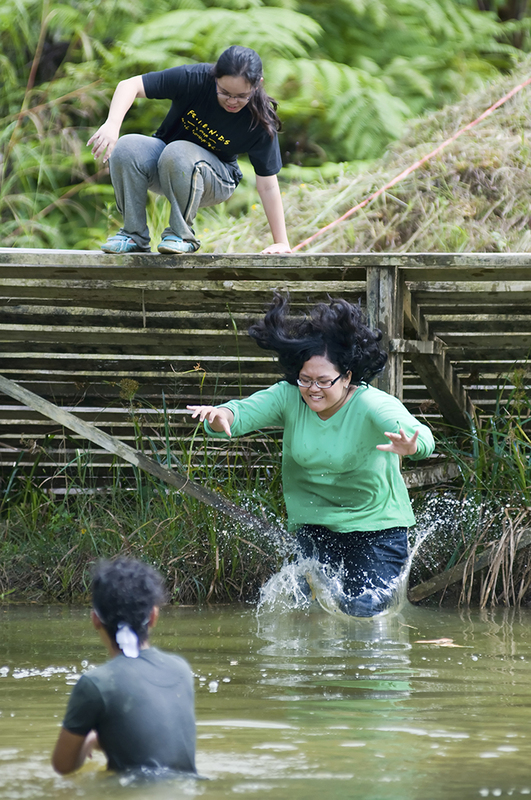 The bloggers have to pass through several obstacles by getting themselves wet and muddy! This is really the test of ‘survival of the fittest’. It wasn’t an easy task to reach the final stretch but judging from the bloggers’ expressions I am sure they had a lot of fun. 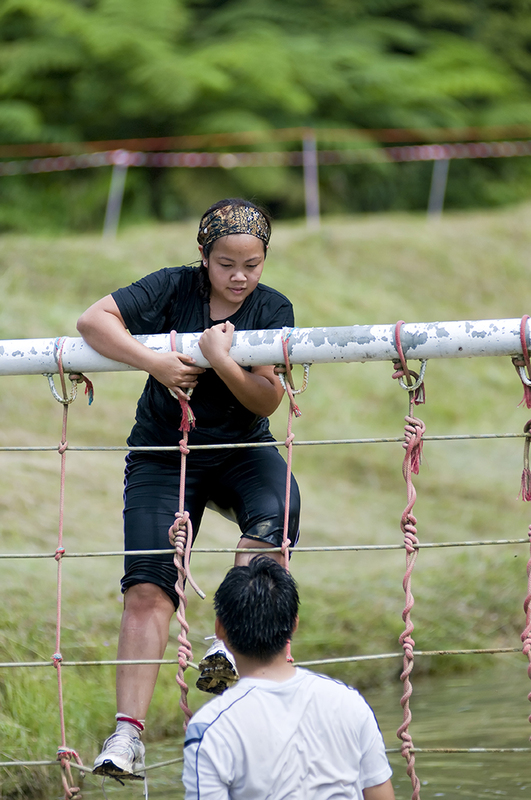 Andi and Low even got up the stage and dance after finish the obstacle courses. Time for celebration! Mr. Zul joined in the fun by doing the Macarena dance. 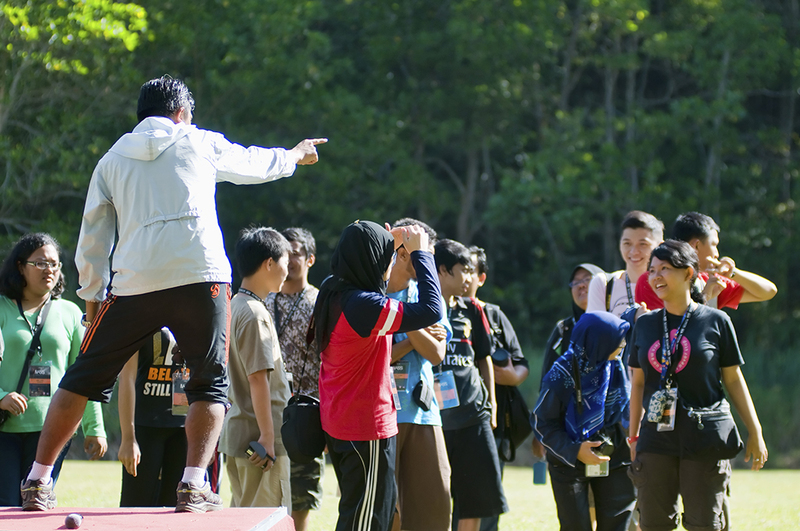 He even remarked that MSS 2011 participants is the best team he ever came across! Kudos to all bloggers! I must say that this is one of the best activity for the day. It was physically demanding but the end results were extremely gratifying. Thumbs up to Awana Genting Highlands Golf & Country Resort. 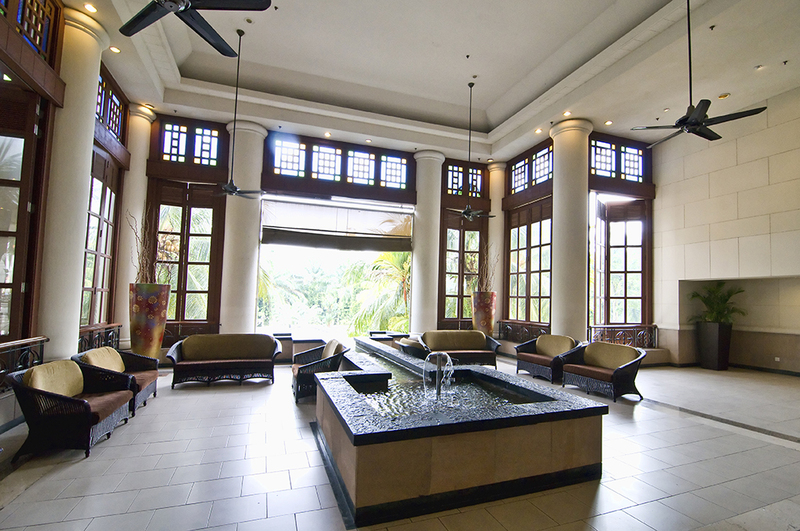 After freshening up, it was time to say goodbye to Awana Genting Highlands Golf & Country Resort. 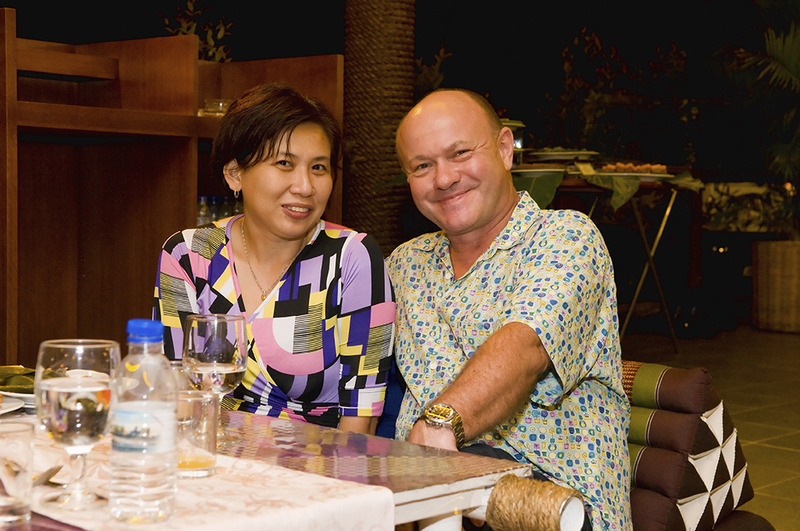 Though we miss your great hospitality, we will never forget the good times we had there. Hopefully we will be back soon, really soon! 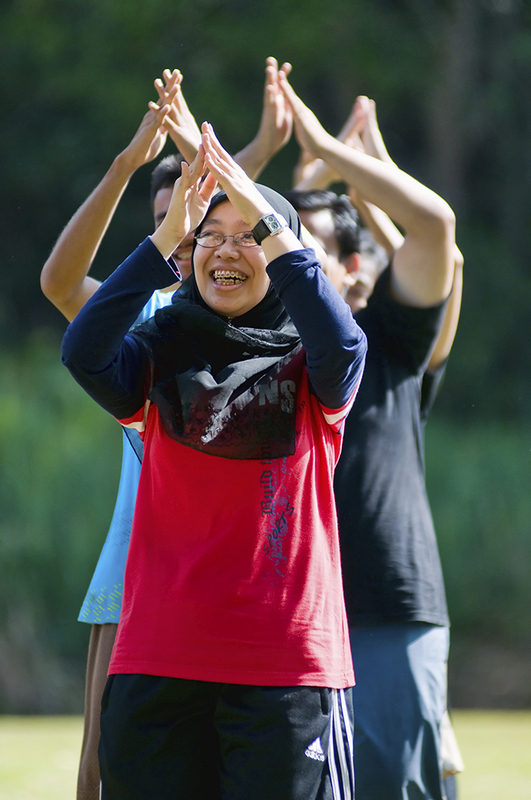 To find out more about Awana Genting Team Building Programs, Eco Sports Activities and Special Fun and Adventure Programmes, click on the link here. I must admit that after being pampered with 5 star resort treatment earlier, this is essentially a throwback to how it is like to stay in a jungle where accommodation facilities were stripped down right to the basics. There were no air-conds (not necessary a bad thing since it is cold at Awana Genting), no ceiling fans, no plush pillows nor thick bed mattresses and no tables or cupboards, attached bathrooms and toilets. Everything were intentionally scaled down to the bare essentials but the quaint part of it is that I find it really enjoyable to bunk up with 10 fellow bloggers in one large room and getting a good taste of spending the night closer to the nature. As for dinner, it was a different story altogether. 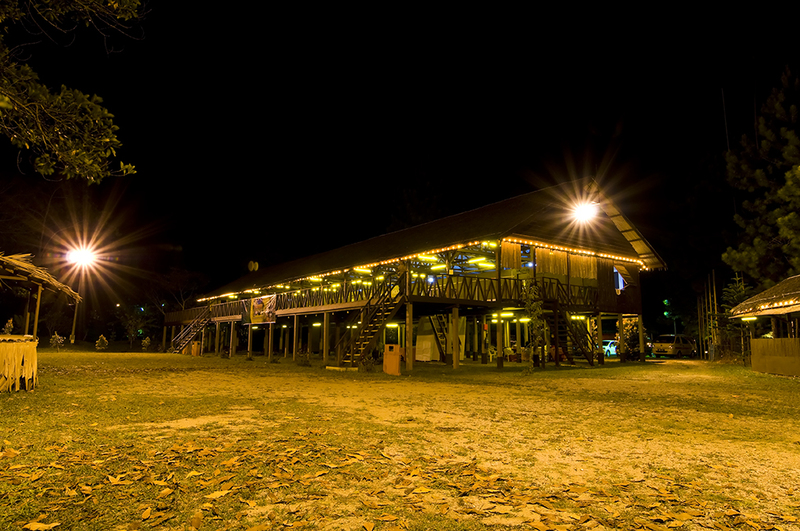 We were treated with a good selection of freshly grilled seafood, local delicacies, desserts and etc courtesy of Pasar Ikan Bakar which is just a stone throw away from the longhouse. 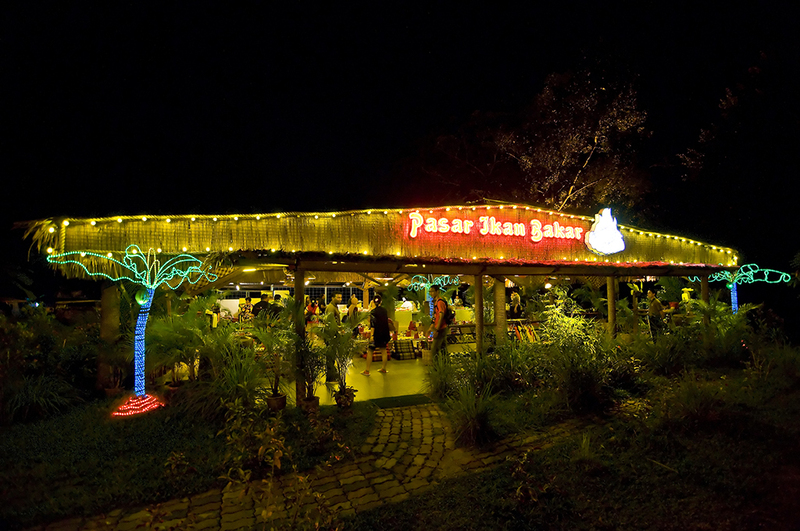 Pasar Ikan Bakar is far from being a market. 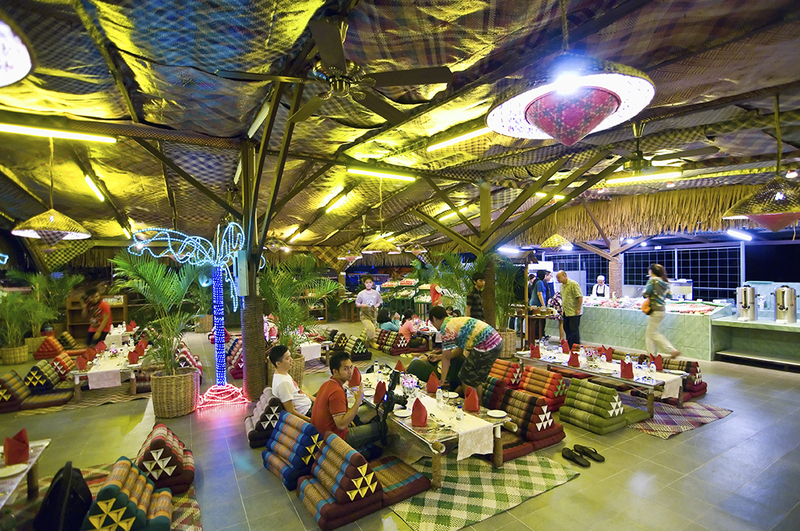 Instead it is a cozy restaurant where guests can comfortably rest on Thai Triangle Pillows while enjoying their meal. 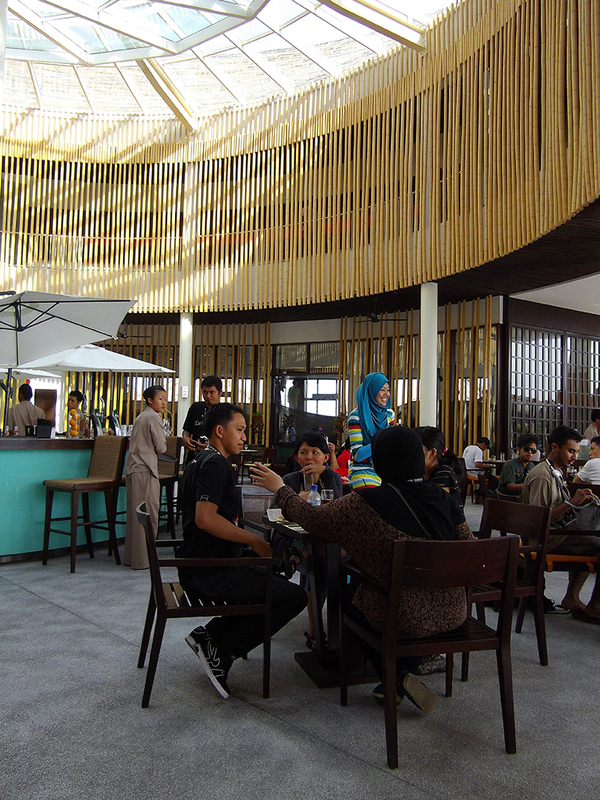 I was really amazed with the elaborate set up and fantastic dining ambience. 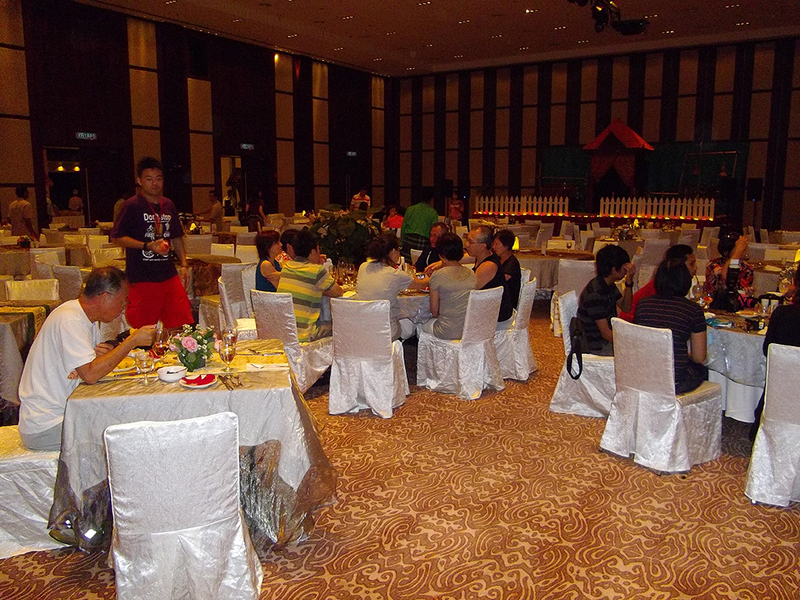 Genting Awana was generous enough to even throw in a live band to keep us all entertained throughout the night. 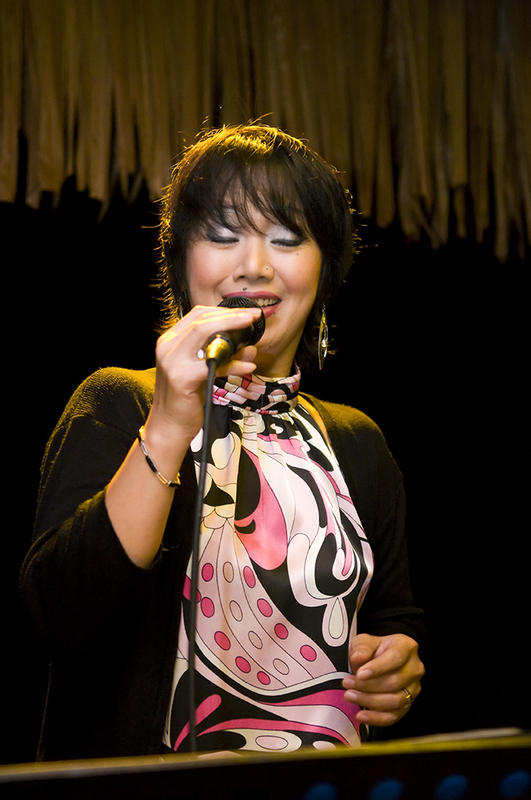 Even our organiser, Amelia Tan was called on to the stage to given a rendition of a popular Malay song. 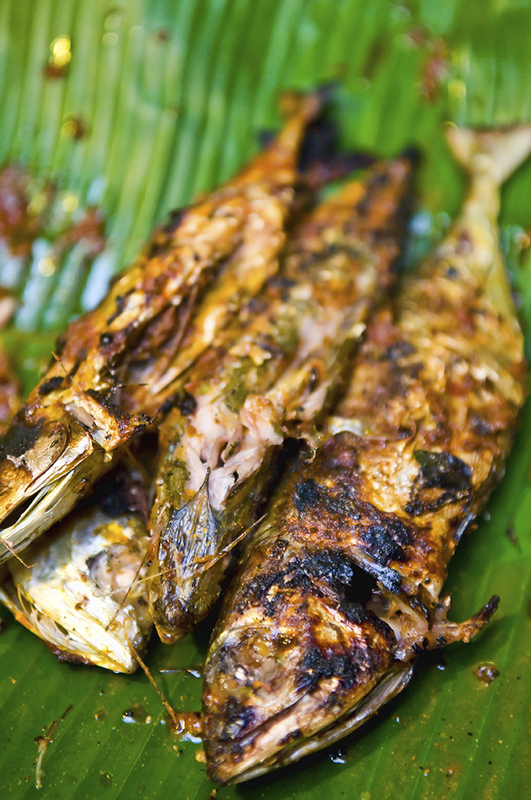 One of the specialty featured in Pasar Ikan Bakar is the Ikan Bakar Special. 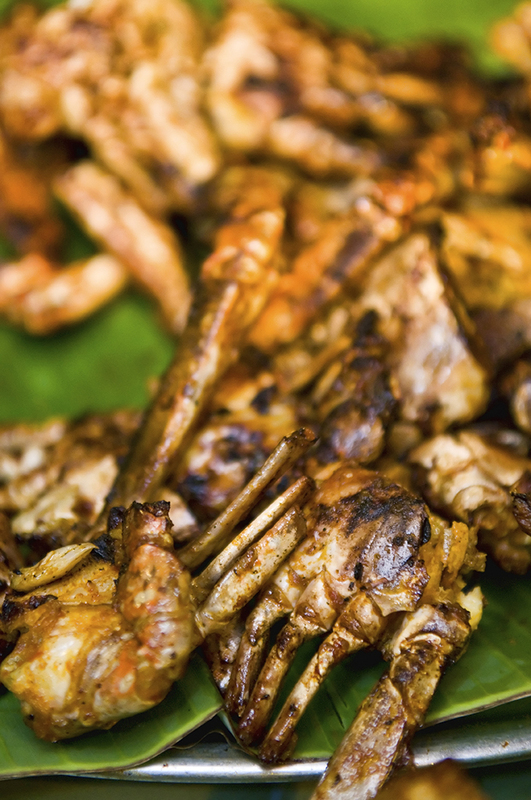 There are also other grilled seafood and meat to choose from. Two thumbs up to Awana Genting for offering such great hospitality. Suffice to say, all of us had so much fun that night that we wish the night would never end. 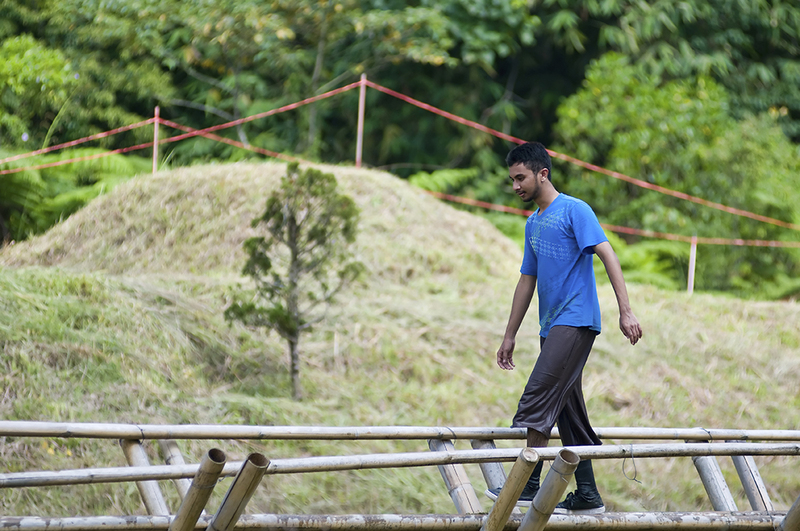 Thankfully, we had another exciting event for the night called ‘Blind Trail’ where all bloggers were blind folded and had to rely on the sense of touch to guide themselves while walking towards the jungle by touching the rope along the path. I admit, it was rather terrifying to be blind folded. What caught me off guard was the surprise birthday cake waiting for me (it was my birthday) at the end of the trail as they sang the birthday song to me. Thanks bloggers! 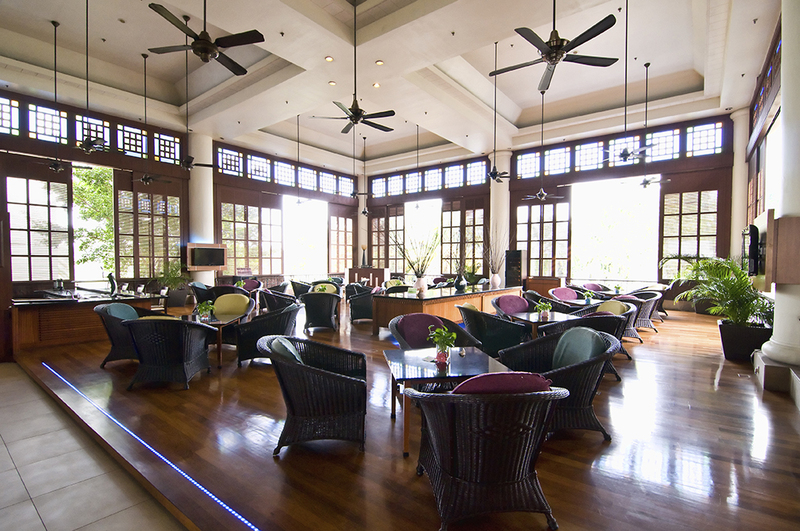 For reservation or enquiries, call 03 – 6436 9000 ext 7619 / 853018 / 53020 or click here for more information.